If your dog is experiencing health problems or skin irritations frequently, you may want to consider switching to a hypoallergenic dog food. Just like humans, dogs can experience allergies that result in upset stomach and extreme itchiness. Hypoallergenic dog foods do not contain some of the most common ingredients that cause allergic reactions in dogs, including many chemical preservatives, food coloring, wheat, and gluten. As a dog owner, you want to watch for some of the symptoms that could indicate that your dog is allergic to the food he/she is eating. If your dog’s stomach is upset frequently and he/she experiences frequent gassiness or diarrhea, a change in foods may be warranted. Chronic ear infections, bald spots, and scratching can also be signs of a food allergy. Keep in mind that your dog may still be allergic to another ingredient in the food, so if your dog continues to experience health issues and skin problems, you might consider having your dog allergy-tested at your veterinarian. They can rule out other health problems that could be causing the reaction, or if your dog does have allergies to certain foods, they can tell you the specific ingredients your dog is allergic to so that you can shop for dog food accordingly. 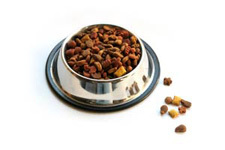 Your veterinarian may even be able to recommend a hypoallergenic dog food that should work for your dog. For example, in one case, a boston terrier with chronic skin irritations was tested and found to be allergic to liver, rice, and potatoes. Only by reading the ingredients listings and comparing those to the results of the allergy testing can the owner be certain that their dog is not being fed a food product they are allergic to. A good first step, though, is to try one of the many hypoallergenic dog foods on the market today, some of which are outlined below. Check your old food, and make sure that the main ingredients in the new food and the old food are different. Remember that it may take up to a month to note a difference in your pet, so give the food a chance to work before moving on and trying something else. Avoderm. Marketed by Breeder’s Choice Pet Foods, Avoderm is particularly good for dogs who suffer from chronic stomach upset and skin irritation. It contains avocado, which is high in vitamins and good for the skin and coat. Acana Lamb and Rice. An organic food, Acana Lamb and Rice formula is free of chemical preservatives, artificial flavors and colors, and binding agents, all of which are common sources of allergies for dogs. It is also free of wheat and gluten, two more common allergens. Manufactured by Champion Pet Foods, Acana is available at specialty pet shops. Flint River Ranch. Available only online, Flint River Ranch produces two hypoallergenic dog food formulas, the Lamb/Millett/Rice formula and the Trout and Potatoes formula. Both formulas are free of chemical preservatives, corn, or wheat. Canidae. Made of all natural ingredients, Canidae is more economical than many of the other hypoallergenic dog foods available on the market today. It is recommended for healthy skin and coats, although some stomach upsets were reported. Canidae is available only in specialty pet shops. BARF diet. Known as the Biologically Appropriate Raw Food Diet or the Bones and Raw Food diet, the BARF diet has been gaining in popularity in recent years. Pet owners who feed their dogs the BARF diet have complete control over which ingredients their pets are ingesting, and there are no chemical preservatives or food coloring added. The diet is made up of a combination of human-grade meats, ground bones, fat, fruits, and vegetables. It does take more time, effort, and expense than kibble, but with the BARF diet, you know exactly what your dog is eating and you can adjust easily for allergies to specific foods.